A lamella clarifier is a primary clarification device, capable of managing feed water with high concentrations of suspended solids. It is a type of settler designed to remove solid particles from liquids. 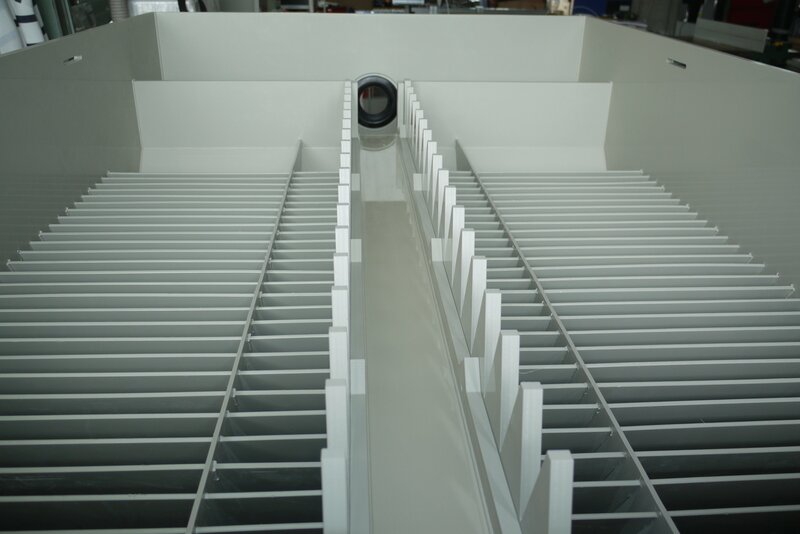 The advantage is that a Lamella clarifier requires up to 80% less space when compared to a traditional settling tank and therefore has a small footprint. 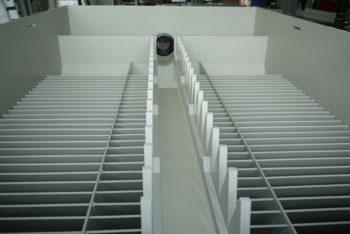 Furthermore lamella clarifiers offer a simple design, without requiring the use of any chemicals. 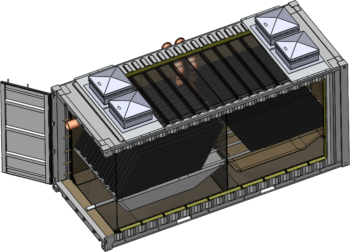 The ClearFox® lamella clarifier can be integrated into a waste water treatment plant as a process technology, or be used as a stand-alone unit. Typical applications are the removal or separation of solids (specific gravity >1.0), grit or metals. A clarifier can operate with overflow rates 2 to 4 times that of traditional clarifiers, thus allowing a greater influent flow rate and resulting in a more time efficient clarification process. The ClearFox® lamella clarifier is supplied as a complete, easy-to-install container or as a plate pack assembly for installation into either concrete or steel tanks. Tanks: 2 chambers, with each chamber rotomoulded as a one piece PE Tank. *sludge feed to separate sludge storage/ dewatering station. The separation results vary and largely depend on the feed water quality and types of contaminants contained. 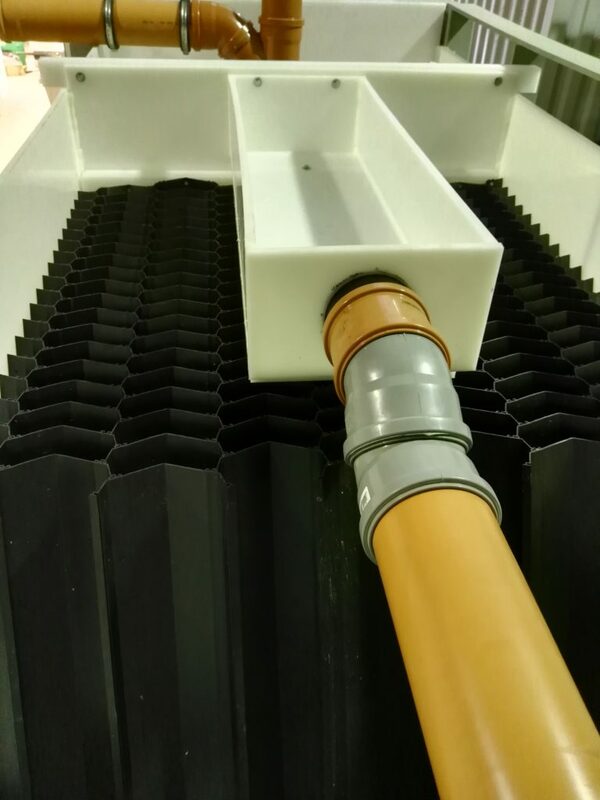 The waste water enters the ClearFox® lamella clarifier through the inlet channel at the top and flows to the bottom of the separator. The water is then led back to the top and in so doing, the water flows through the lamellas, onto which the solid particles settle. The treated water continues its journey to the top and reaches the outlet by passing a weir. The solid particles (sludge) on the lamellas, slide down the lamellas and are collected in the sludge funnel. The sludge is then exported at intervals, as defined in the control programme. Installed alarms inform of any malfunction (when the sludge hopper is full or the settlement process is failing). This settlement process is highly effective and operates with minimal maintenance.